24th January 1991 was the day at Paramount Towers Hotel in Calicut. Clock was ticking around midnight, a silent heart attack left a man sleeping in his room alone. Gandhimathi Balan knocked at the doors of Producer Goodknight Mohan and Nitish Bhardwaj. They all rush through the room to know that what happened to that man. Mohanlal also made it to the hotel to know about this man, but it was too late. That man was Malayalam Cinema's genius P.Padmarajan as every film lover popularly known him as "Pappettan". higher studies with M.G.College and University for the graduation in Chemistry in 1963. Padmarajan's touch in Sanskrit enhanced under the guidance of Achyutha Warrier. In 1965, He joined All India Radio, Thrissur and continued as a programme announcer until 1986, after this he chose to voluntary retirement from AIR . He also shifted to Poojapurra in 1968 to concentrate on his story and script writing. "Nakshatrangale Kaaval" was his first novel, which bestowed Padmarajan with Kerala Sahithya Academy Award in 1972, which turned to the cinema by Director K.S.Sethumadhavan. Then came the golden era of Malayalam cinema in 1975, with the new approach to the Malayalam films which gave new meanings to the commercial and intellectual based cinemas. Padmarajan step to the Malayalam cinema world with Director Bharathan's first movie "Prayaanam" by preparing the screenplay for this film. Along with Bharathan and K.G.George, he maintained his stature for the "Parallel Films". He continued to script for films "Thakara", "Rathinirvedam", "Itha Ivide Vare", "Vadekyoru Hrudayam", "Idavela". On 1979, Padmarajan began to direct the films based on his own script, on this pattern the first release was "Peruvazhiambalam", which gave him the National Award for Best Feature Film. In the span of seven year, he won again an Best Film National Award for "Thinkalazhcha Nalla Divasam". On this criteria Master gem piece like "Thoovanathumbikal" and "Deshadanakilli Karayarilla", striking to the depth of a society. "Nammuku Parkan Munthiree Thopukal", "Novemberinte Nashtam", "Kallan Pavithran", "Oridathoru Phayalvaan", "Koodevide", "Moonampakkam", "Aparan", "Innale", "Njan Gandharvan" include his craft of Malayalam cinema. Padmarajan's assistant's are still making proud movies in malayalam cinema include Thopil Ajayan, Suresh Unnithan, Blessy are few of them and introduced many actors to the Malayalam cinema, whether it is Rehaman and Suhasini through "Koodevide", Jayaram made his debut through "Aparan", Nitish Bhardwaj in "Njan Gandharvan", Ajayan through "Moonam Pakkam". His death came as a shock for the lovers of Malayalam cinema, while on the promotion of his last film "Njan Gandharvan". It was a huge loss to the film industry of Indian Cinema. Padmarajan married to his mate from AIR, Radhalakshmi in 1970. Their children are Anantha Padmanabhan and Madhavikutty. Padmarajan definitely gave a new definition to the malayalam cinema with the foundation of new film making method. 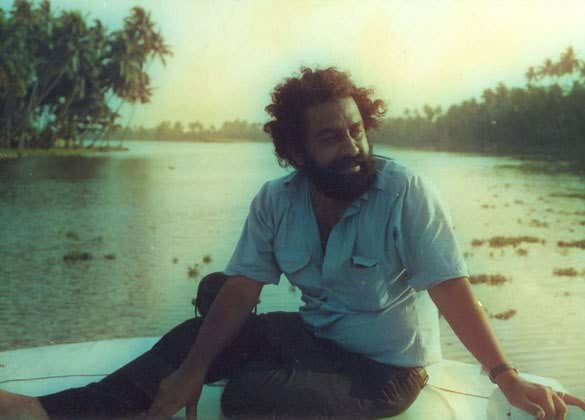 mollywoodframes.com pay tribute to this legend named P.Padmarajan on his 21st death anniversary.